I was a little over-confident on Saturday but I learned my lesson (yet again) after staying up most of the night waiting in vain the first litter for this year to arrive. 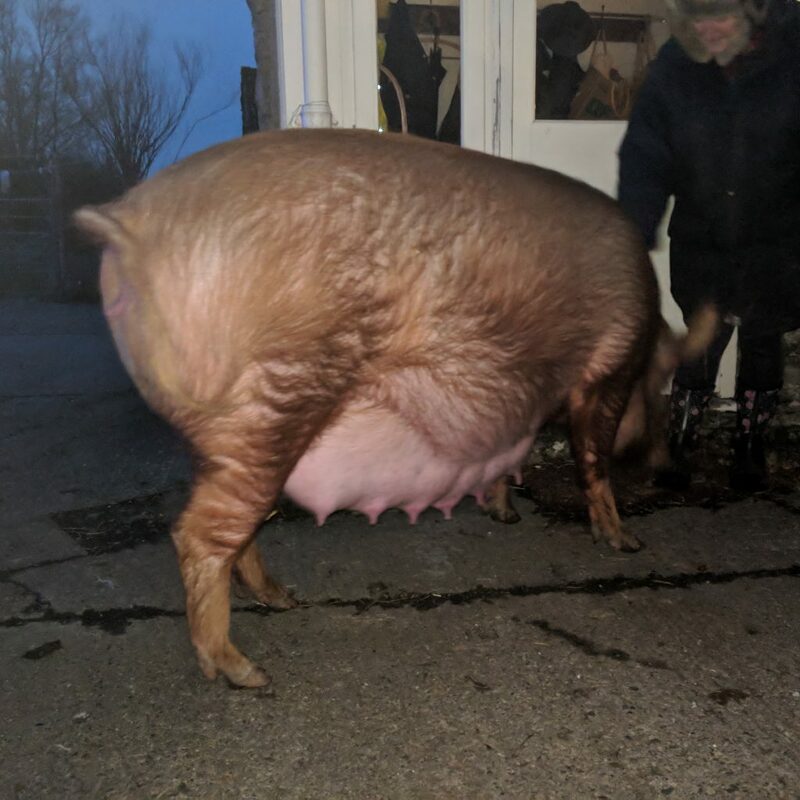 Over the last few weeks I had been convinced that Saturday would be farrowing day mostly because her last litter came after just 112 days. However Esther had her own ideas on the subject and decided to hang on a little longer this time. 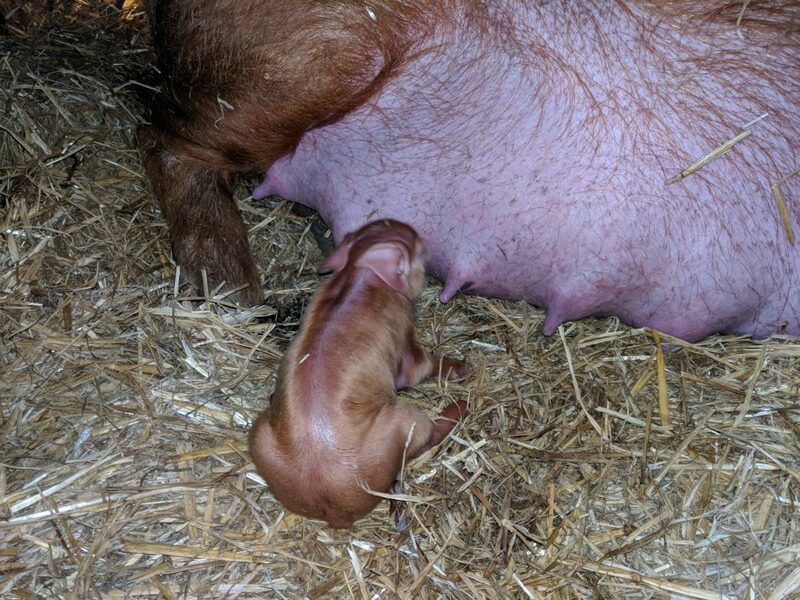 As a result she was quite a size by Sunday morning so I knew it couldn’t be too much longer. There was a brief period at the start where just the single piglet was suckling which was a strange sight but it wasn’t long before the others turned up. Eventually we ended up with 10 healthy looking piglets under the heat lamp while we waited for Esther to settle down. Even though the piglets should ideally suckle as soon as possible, the best approach for me is to dry them off and put them under the heat lamp out of the way. This helps to prevent any unfortunately accidents or losses which can be really hard to take. There was a slightly nervous 2 hour wait after the last live piglet appeared but that was eventually ended by the arrival of a stillborn piglet. Two of them were just a little smaller and seemed to be struggling as first which is always a worry. They immediately went into a warm place which unlike last year was not the oven! This time we used an insulated bag with a hot water bottle and within an hour or so they were much more lively. 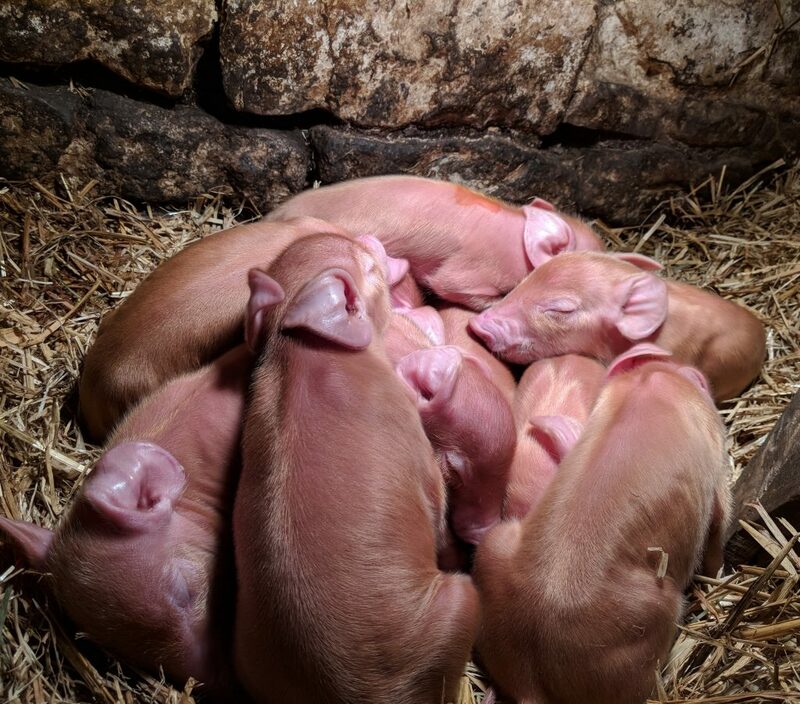 Definitely something we will use again as it means you can keep all the piglets in the same place rather than dashing between the farrowing shed and the house to check on everyone. In due course a few of these will be for sale as weaners but this year some of them were reserved in advanced and we also need to consider if we are keeping some for meat ourselves. I’ll also keep an eye on the calendar too because Sissy will be due to farrow a couple of weeks after these piglets have left. For the moment though we can just enjoy watching their progress over the coming few weeks. Oh what lovely little things, don’t they have pretty looking ears?! And what a good haul! We will be in the market for a couple of weaners later this year, will you be posting any availability on here? Yes, I’ll be advertising a few weaners for sale in the next week or two but some of this litter were already reserved. However, from looking at your blog it appears you’re in Hampshire which is surely too far from us in Northumberland!